With Samsung’s latest devices, they’ve been using different materials and design on the back. I guess you could say they are experimenting with them to see what people like. They used the faux-leather on the back of the Galaxy Note 3, Galaxy Note 10.1 2014 Edition, Galaxy TabPRO 8.4, 10.1, 12.2 and the Galaxy NotePRO 12.2 tablets. While they used a different back on the Galaxy S5, which was meant to look like the back on the OG Nexus 7, but according to people who have looked at and used the Galaxy S5, it doesn’t feel the same. But the Galaxy S5 Zoom appears to be using a faux-leather back, which should be interesting given that it’s basically a point-and-shoot camera. The picture above is from KZoom which shows off the Galaxy S5 Zoom, or the Galaxy K.
The Samsung Galaxy S5 Zoom is expected to land with a 4.8-inch AMOLED HD display, the Exynos 5 Hexa-core processor, 2GB of RAM, a 20-megapixel camera and a few other good looking specs. 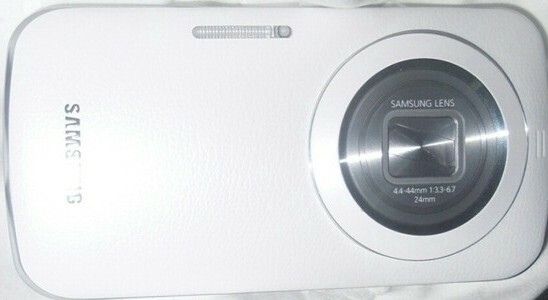 But since the Galaxy S4 Zoom was all about the camera, I’d expect the Galaxy S5 Zoom to be the same way. In addition to 20 megapixels, it’ll also have 10x zoom and a Xenon flash, which should provide it with some pretty good pictures. Although it’d be awkward to use it as a smartphone. As the Galaxy S4 Zoom was awkward to use as a smartphone or even just a phone, according to our Managing Editor, Tom Dawson, who reviewed it last year. I wouldn’t expect the Galaxy S5 Zoom to replace your high-end point-and-shoot camera like the Sony RX100 MII, but it’ll still be a nice camera to have in your pocket, given that the bump for the lens isn’t too big. How many of our readers are interested in the Samsung Galaxy S5 Zoom? Be sure to let us know in the comments below. The post Samsung Galaxy S5 Zoom Poses for the Camera with its Faux-Leather backing appeared first on AndroidHeadlines.com |.